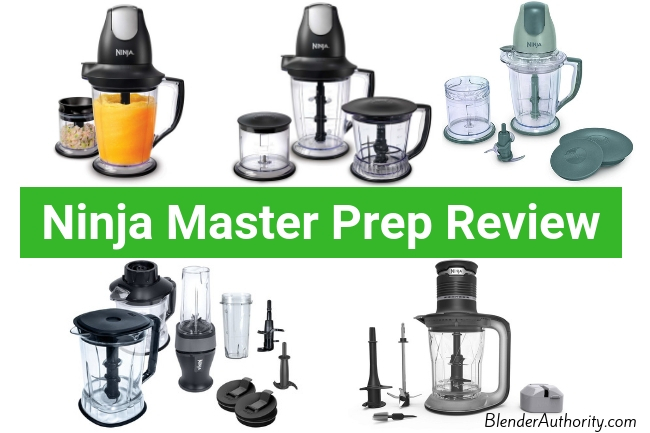 In our Ninja blender review guide, we get a lot of questions about the Ninja Master Prep food and drink maker product line and how it compares to other Ninja blenders. In order to answer those questions, we put together this comprehensive Ninja Prep review which analyzes all of the different Ninja Master Prep models. What is the Ninja Master Prep ? The Ninja Master Prep product line continues to be one of the most popular products from Ninja brands due to its affordable price point, decent performance, and range of uses. The unique design of these blenders is that it uses an inverted design. What I mean by “inverted” is that the motor is on top and the blade goes down into the container. Due to the wide containers, which allow full contact with the ingredients, these small mixers work surprisingly well for food prep, making ice cream, crushing ice, and basic blending tasks. 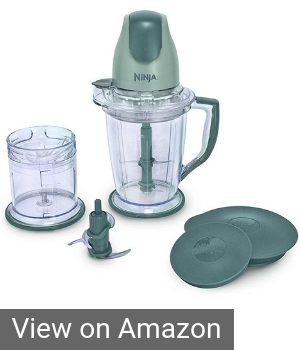 Keep in mind that the blade design of these models works differently than traditional blenders in that the blade on these Ninja models pushes the ingredients out and up. Whereas, normal blender blades pull the ingredients down into a vortex to create a fine puree consistency. The specific models in this Ninja product line have changed over the years but the design is very consistent across all models. They have a motor and blade on top with a single-speed hand push control. It is like having a large immersion hand blender combined with a conventional small food processor. This product line includes the Ninja Storm, Ninja Master Prep, and the new Ninja Ultra Prep. SIDE NOTE – There is also the Nutri Ninja 2-in-1 that is part of the Nutri Ninja blender line. The Ninja 2-in-1 is more of a personal blender that also inverts to work as a small food prep blender. The Ninja Prep Master (Models # QB1000 / QB1004 / QB1005) is by far the most popular model in this product line. 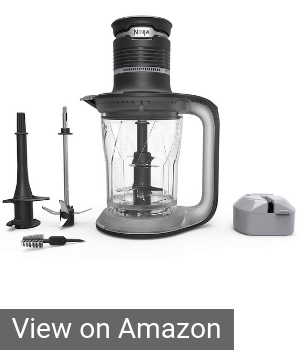 It is a slight improvement over the original Ninja Storm blender (see Storm review below) with similar design but the Master Prep adds a little more power and more accessories. The Prep Master Professional has been a huge seller due to its versatility and affordable price. Difference in Ninja QB1000 vs QB1004 vs QB1005 ? The Master Prep Pro System QB1000 offers 450 watts of blending power with a 16z oz chopper bowl and 48 ounce pitcher. The Ninja Master Prep Professional QB1004 is the same as the QB1000 above but adds in the 40 ounce processor bowl and blade. Ninja Master Prep Professional QB1005 is the same as the QB1004 but has two 16 ounce prep bowls instead of one. The Ninja Prep Master performance and design is the same as the older Ninja QB900 blender that I review below. The QB1004 costs slightly more than the QB1000 because you get the extra 40oz processor bowl and blade. What can you make ? The Prep Master Pro is ideal for making frozen drinks, crushing ice, frozen desserts like ice cream, dips, salsa, cold soups, fruit smoothies, and basic food prep tasks. Here is a link to download the recipe book that comes with the product to give you an idea. Positives: The Ninja Prep Master is versatile with plenty of power. Easy to use and clean. It performs very well and continues to rate well with testers and 1000’s of consumer reviews. It performed well in Consumer Reports blending tests. The wide food processor bowl does a good job at chopping. Like other Ninja blenders that use the total crushing blade, the Master Prep is awesome for chopping ice and blending frozen drinks (It was one of our choices for ice blenders). Negatives: A little bulky with multiple containers to store. It is made of plastic with a lightweight feel to it so there is a chance for the plastic to chip from heavy use. The blending blade works well for fruit smoothies but it won’t blend fibrous vegetables as finely as a conventional blender because it doesn’t pull the ingredients down into a vortex for a fine puree consistency. Overall Opinion: The Ninja Master Prep Professional is a great device with simple functionality for a reasonable price. The simple single-speed control and ability to pulse are popular selling features. While it won’t blend difficult green smoothies to the same consistency of a conventional blender, it does pretty well with most ingredients. Overall, consumers love the performance of this appliance and it is a good choice if you want an affordable drink and food prep device in one. With the popularity of the Ninja Master Prep Pro above, the company recently introduced the Ninja Ultra Prep (Models # PS100 / PS101 / PS101A) which is a 700 watt food and drink maker. The Ultra Prep has an updated design and features compared to the Prep Master. The motor is called a “power pod” and the Ultra Prep includes a 48 ounce jar with lid and 3 interchangeable blades. The high speed blade is for smoothies, dips, purees. The dough blade works for pizza crust, dough batter, and bread. The crushing blade is for chopping and blending ice. Besides the significant increase in motor power, the main difference in the Ninja Ultra Prep vs Master Prep is that the Ultra Prep only uses one container for all its tasks rather than multiple containers. The Ultra Prep can easily do everything that the Prep Master does as well as making up to one pound of dough, grind meat(with the total crushing blade), and finely puree ingredients for soups and smoothies. Positives: Simple to use and plenty of power for thick recipes. The new high speed blade is an improvement over the Master Prep blade for blending green smoothies. Less containers to store with the Ultra Prep compared to the prior models. Nice versatility for various blending and food preparation jobs. Negatives: It is more expensive than the Ninja Prep Master due to the new design and stronger motor so it starts competing in price with top rated individual food processor and blenders. While this model is brand new on the market with little feedback, it has similar design to their well-tested previous models in this product line. Overall Opinion: A great multi-functional appliance that has plenty of power for the 48 ounce (6 cups) container. It is about as tall as a standard blender but the Ultra Prep is light and easy to store. The Ninja Ultra Prep isn’t meant to replace a full size food processor but it definitely could replace the need for a small food processor. This is a good choice if you want a personal smoothie blender and compact food processor all-in-one device. Ninja Master Prep vs Ninja Ultra Prep ? The Ultra offers more power, new blade and motor design, and dough making capability. The capacity is the same between the two blenders so the additional power of the Ultra helps with thicker recipes like ice cream, dough making, and improved puree consistency when blending more difficult ingredients in green smoothies. The downside is that the Ultra Prep costs about 80-100% more than the Master Prep. Keep in mind that the Ultra Prep’s 700 watts is enough power to use it as both a personal blender and compact food processor which would be a costs savings compared to buying each appliance separately. The Ninja Storm series (Models: QB700Q / QB751Q / QB900 / QB900B) was released back in 2013 and was popularized by QVC infomercials. Most of these models (except the popular Master Prep QB900) have been discontinued and replaced with the updated models above. 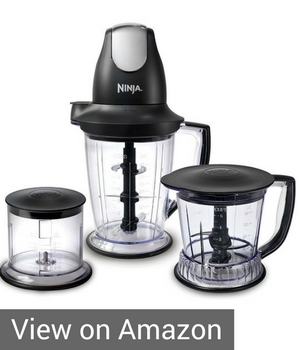 Like the other Ninja drink mixer reviews above, the Ninja Storm uses an inverted blender design where you place the motor base on top like you would with an immersion hand blender. The QVC Ninja Storm models had a 400 watt motor and 40 oz pitcher. The QB900Q is still a top seller on Amazon.com and very similar to the QVC model with the same 400 watt motor but slightly larger 48 ounce pitcher. The QB751Q is slightly more powerful with 450 watts and a smaller 40 ounce container. Popular uses for the Ninja Storm mixer is crushing ice, making ice cream, baby food, basic blending, and food prep such as dicing and chopping. The affordable QB900B model is still very popular and a great choice if you are on a budget. Is it Dishwasher Safe ? Yes, all of the Ninja Master Prep Professional containers and lids can be washed in the dishwasher on the top shelf except the blades. Does it crush ice well ? Yes the total crushing blade is amazing for crushing ice. 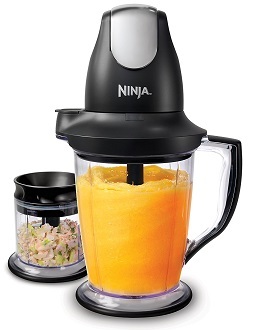 It is the same blade design used on full-size Ninja countertop blenders. Can I make hot soups ? NO. You can blend ingredients into soup-like consistency and then heat the ingredients up on a stove but the Ninja Prep containers are not made for hot liquids or hot ingredients. Is the Master Prep heavy or lightweight ? It measures about 12 inches tall and 6.5 inches wide and weighs 3.5 pounds. Does it blend well ? It blends most ingredients pretty well if you use enough liquid. Some consumers that are used to blenders might find that the Master Prep won’t puree certain hard or fibrous ingredients to the same consistency of a normal blender because of the blade design. How loud is it ? It is loud but not really any different than a food processor or full size blender. Ninja master prep baby food ? Yes the Master prep can easily blend soft foods for baby food. Where to buy the Master Prep ? For the Prep Master Professional models, they are identical blenders except the accessories. The most popular is the QB1004 on Amazon which is a good price. The Ninja Prep Master Professional is still very, very popular and a good buy for the performance that it offers. It really is a great substitute to needing a separate compact food processor and small blender. The Ninja Ultra is brand new on the market and pricing could possibly come down but it does have a lot of mixing power for the container size. Let me know if you have any questions or are trying to decide on a specific model. Hi Rick, If you have the Ninja Fit then there is only tte 16oz cups. If you have a Nutri Ninja personal blender model or one of the fullsize counterop Ninja blenders that also works with small personal cups.